Ever since Beyoncé released her self-titled 2013 album on all online platforms with absolutely no warning, everyone's been keen on doing the last-minute surprise drop. 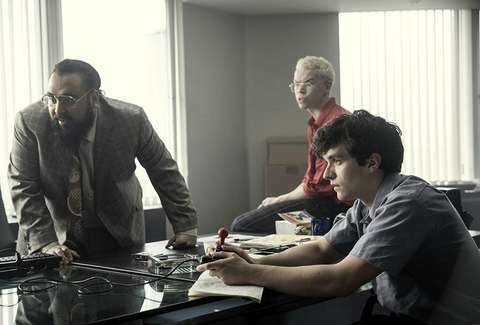 Netflix, particularly Black Mirror, loves this format, and has gotten really good at hyping up something like their new Bandersnatch in a matter of days, so that it becomes essential to watch if you want to understand why all your friends are talking about killing dads and tugging earlobes. Bandersnatch, Black Mirror's new "interactive film," models itself after those choose-your-own-adventure books we all loved as kids of the '90s: the viewer makes choices for the main character, Stefan (Fionn Whitehead), who's caught up in development crunch time to get his game adaptation of the fictional choose-your-own-adventure novel Bandersnatch out by Christmas, by using their own personal black mirrors. It allows anyone watching it to drive the action, and includes a number of different endings, each bleaker than the last. Ultimately, it works better as an experiment than a cohesive story (or five), but that doesn't mean it wasn't worth the hype. For many, interactive television is looked upon as the next frontier of entertainment, right up there with virtual reality goggles and shouting the names of songs at your Amazon Alexa across the room during a party. Netflix has tried it out before with properties geared toward children, but this was their first attempt at an adult-oriented interactive movie. And since grown humans are a little more discerning than kids, and since we all know by now that Black Mirror is at least capable of making truly exhilarating episodes (cheers to Season 3's "San Junipero," Season 4's "USS Callister," etc. 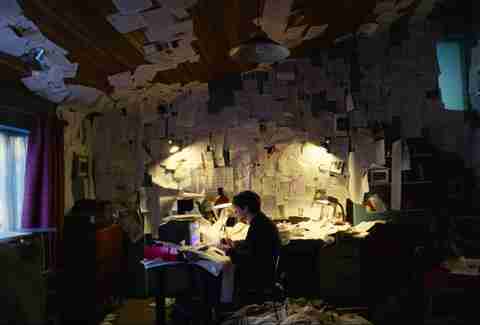 ), there was a lot of pressure to make Bandersnatch not only entertaining, but good. Of the achievable endings, there's a good payoff or two amongst the more abrupt and disappointing ones, but they take a while to find. You can get stuck down a hole of trying to find what must be THE ending, the final chapter that gives the rest of the journey its meaning -- not unlike our hero Stefan himself, going crazy with all the choices, or lack thereof, he's presented with. But there isn't one; or rather, there isn't an ending that feels like it's the right one, the one where you win and everyone survives, because Bandersnatch is a classic unwinnable game. What's frustrating is this can take a few hours to figure out, while you're playing back through paths you've seen before just to get to the one you hope might lead you to the right answer. It all depends on whether or not you'll be satisfied with Stefan's game getting completed but receiving a bad review, or Stefan killing his dad (and his mentor, Will Poulter's Colin Ritman) and going to prison, or Stefan finding out that his entire childhood was a psychological conditioning experiment run by a shadow government. There's a point at which you realize, oh, that's it. Watching -- or playing -- Bandersnatch requires a lot of patience to get through scenes you've already seen, which makes this a slightly more tedious experience than the choose-your-own-adventure books the project was modeled after. In those, you could skip over the bits you'd already gotten through, but in order to survive Bandersnatch you'll have to get really familiar with the 10-second fast-forward tool (there's no scrubber to fast forward through at the bottom of the screen this time). I won't spoil any of the more worthy endings for you, or any of the other choices you'll have to make, but I will say that Bandersnatch returns to Black Mirror's by now very familiar formula of bleak, depressing, and scary. No matter what, even if Stefan finishes programming his computer game and it gets glowing reviews, he has to die, or kill his dad, or cause someone else to kill themselves. It requires Stefan to descend to the darkest depths of himself in order to succeed in what he's doing, which feels bad, as the viewer, to do. No matter how many times you go back and try again, you're guided towards an undesirable outcome (unless you just love whacking middle aged men with crystal ashtrays). 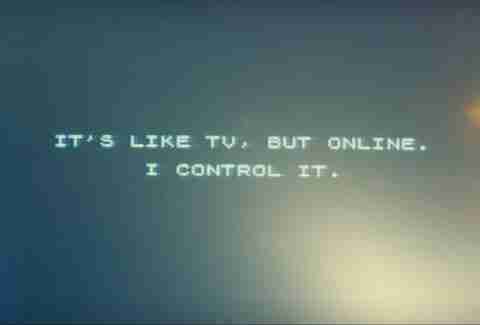 Bandersnatch would have been stronger if it had had less of Netflix's frankly creepy new brand of self-awareness. It's a choose-your-own-adventure movie about a choose-your-own-adventure game based on a choose-your-own-adventure book! Packed with allusions to other Black Mirror episodes along the way! That's quite meta enough! There's a particularly cheeky bit where the viewer can actually attempt to explain to Stefan that they are controlling his actions through a future entertainment technology called "Netflix" -- which only further drives him insane. But most of the episode's tricky circular paths and repetitions and hints towards a broader understanding of itself muddle the actual story and turn it into a little more than a messy thought experiment. The way choose-your-own-adventure stories work, each switchback in the reader's journey to get to the final payoff involves introducing new avenues of choices, like the roots on a tree, that steer you towards the eventual happy conclusion. In one of the permutations of Bandersnatch, Stefan finishes programming his game by essentially doing away with the "illusion" of choice altogether, and driving the player to an outcome they were always going to reach either way -- which generally feels like Netflix talking straight to the audience, letting them in on the fact that, with all the time and frustration and walls of sticky notes we've invested in it, Bandersnatch has been playing us all along. Which is maybe the most Black Mirror thing Black Mirror has ever done.